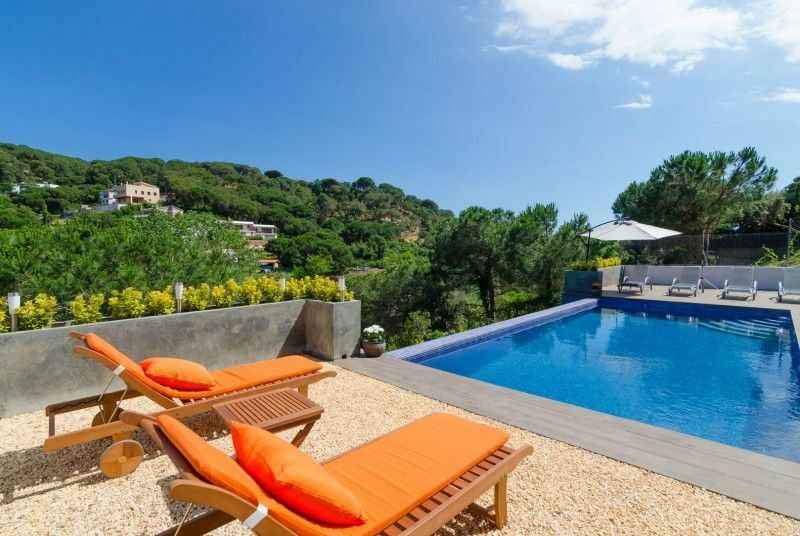 This beautiful and superbly located 5-bedroom villa accommodates 10 people and has a private pool and breath-taking views over the wooded area. Villa Gleymar is located on a dead end street in a residential area, with only local traffic. Your car can be parked safely on site. Because of its ideal quiet location, just 1000 meters from the beach, Villa Gleymar is the perfect holiday location for families. Villa Gleymar is a fully detached villa, located below street level, and has a living area of 200m2. The entrance is on the first floor, where you will find the fully furnished living room with fireplace. The living room has large sliding glass doors that offer stunning views of the surroundings, and give access to the balcony. The balcony is equipped with a dining table and a stone barbecue, for al fresco dining against the backdrop of the magnificent views. On this floor there is also the fully equipped kitchen and 1 bathroom. On the ground floor you will find 5 bedrooms and 2 bathrooms. The stylish modern interior of this well-maintained villa is light and has a very cosy and warm ambiance. The villa also offers free Wi-Fi! At the rear of the villa is the beautiful private swimming pool, which can be reached down a short flight of stairs. Enjoy taking a refreshing swim, or if you prefer just relax around the lovely pool on the sun loungers that are provided. The villa also has a beautiful natural garden. Villa Gleymar offers everything you need to enjoy the Spanish lifestyle in the sun! Lloret originated from a pre-Roman settlement, which can even today still be visited. The main attractions are the church of San Roma, Sant Joan’s Castle and several hermit chapels. Traditionally Lloret de Mar was closely linked to shipbuilding and fishing, as was the picturesque town of Tossa de Mar, situated 11 kilometres away, but in the mid-20th century tourism became the focus. This created an excellent combination between the atmosphere of the old historic city centre with its many shopping streets, and the contemporary active night life with its many pubs and clubs. The beautiful botanical gardens of Marimutra, located in Blanes, where you can find more than 3000 plant species, are very much worth a visit. Also situated just 15 kilometres from Lloret is the lovely, typically Catalan town of Vidreres. Vidreres is still unspoilt by mass tourism and therefore you can still mingle with the Spanish population here.